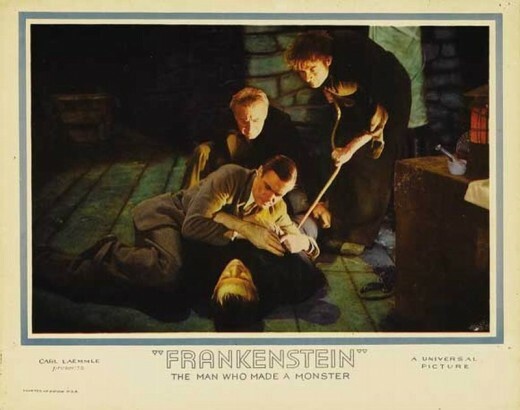 Frankenstein was directed by James Whale and premiered on the 21st November 1931. 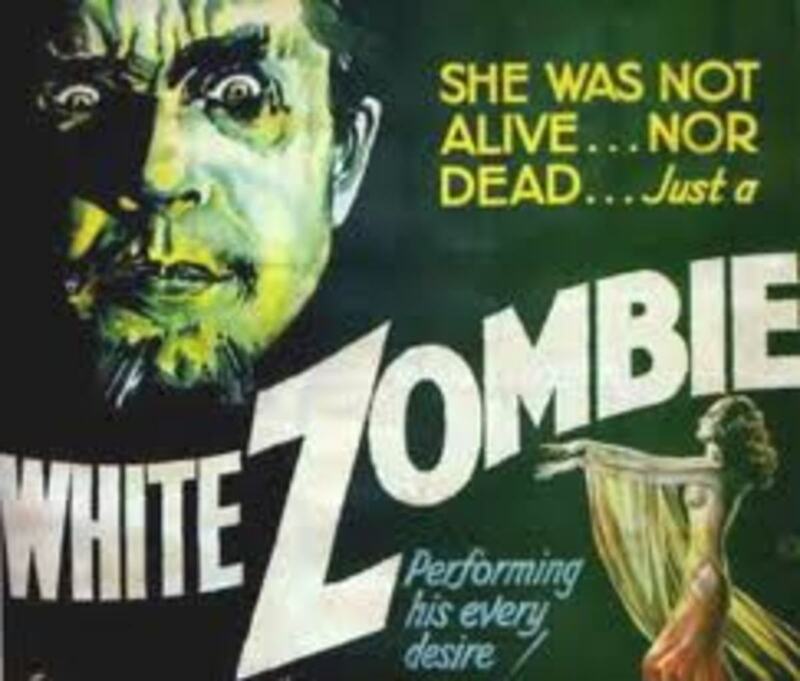 It starred Colin Clive, Mae Clarke, John Boles, Edward Van Sloan, Dwight Frye and Boris Karloff. Screenplay by Garrett Fort & Francis Edward Faragoh. Based on the novel by Mary Shelley. Music by Bernhard Kaun. 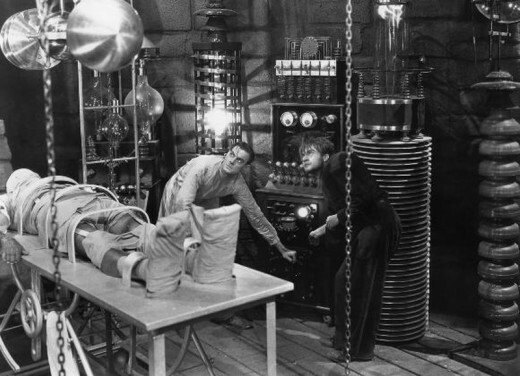 Dr. Henry Frankenstein has stitched together dead body parts and is planning to bring his humanoid creation to life. But he still needs to give it a brain. 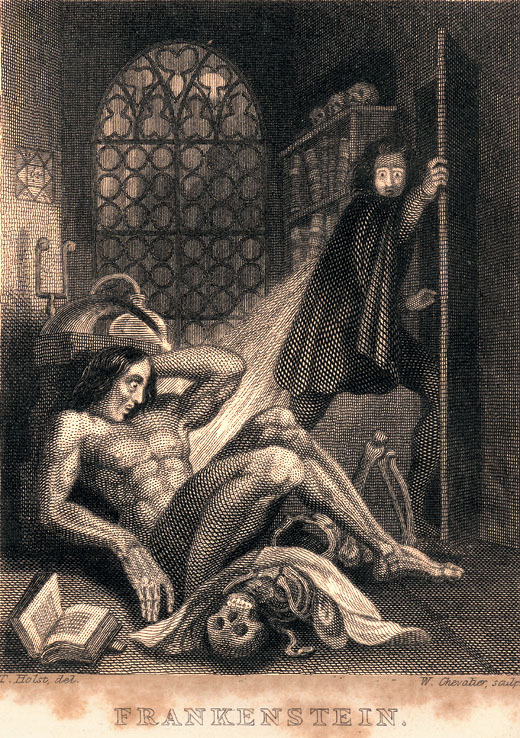 From the preface to Frankenstein; or, the Modern Prometheus (published 1818). Henry Frankenstein: Look! It's moving... it's alive, it's alive, IT'S ALIVE! Colin Clive (1900-1937) / Henry Frankenstein (Victor Frankenstein in the novel) a scientist obsessed with creating a living man from dead body parts. He succeeds but the creature has been given a criminal brain thanks to his incompetent assistant Fritz (Dwight Frye). Leslie Howard was also considered for the role. 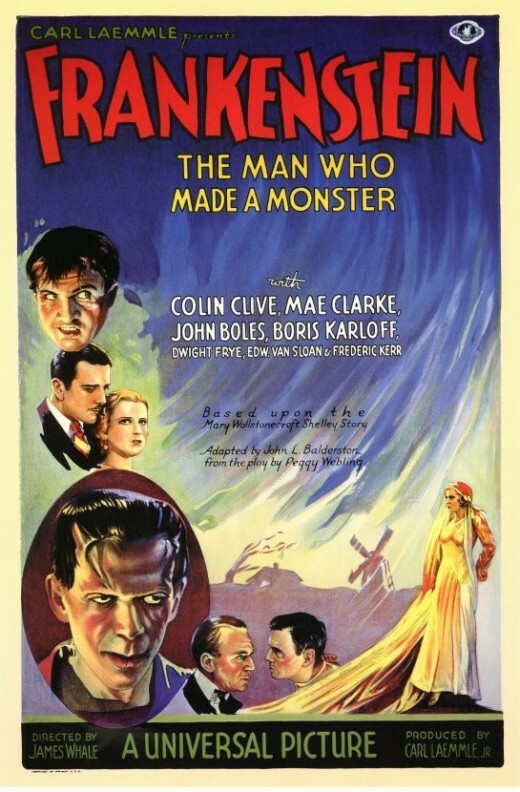 Born in St. Malo, France, Colin Clive’s first movie was Journey’s End (1930 James Whale), he starred in Mad Love (1935 Karl Freund) along with Peter Lorre, and he played Dr. Frankenstein again in the sequel Bride of Frankenstein (1935 James Whale). Mae Clarke (1910-1992) / Elizabeth, Henry’s fiancé, she’s very worried that Henry is spending too much time in his laboratory in the old abandoned watch tower, and doesn’t get out much (well except when he’s out grave robbing with Fritz). Born in Philadelphia, Mae Clarke was probably best known as the girl who gets one half of a grapefruit squashed into her face by James Cagney in The Public Enemy (1931 William Wellman). Dr. Waldman: And you really believe that you can bring life to the dead? 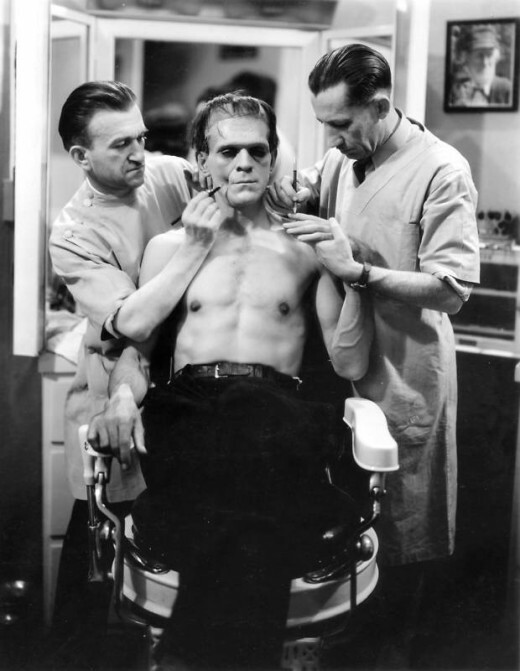 Henry Frankenstein: That body is not dead. It has never lived. I created it. I made it with my own hands from the bodies I took from graves, from the gallows, anywhere! Go and see for yourself. Boris Karloff (1887-1969) / The Frankenstein Monster. 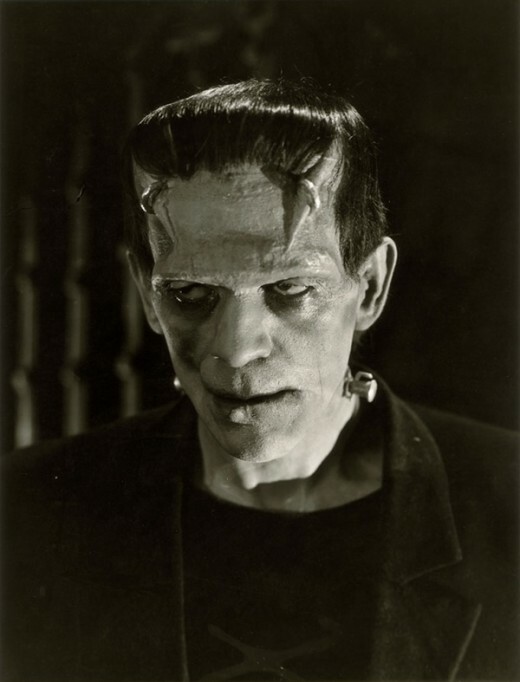 A brilliant performance by Karloff, wearing Jack Pierce’s genius monster makeup, he makes the monster seem pathetic, confused, pitiful, with a childlike innocence. 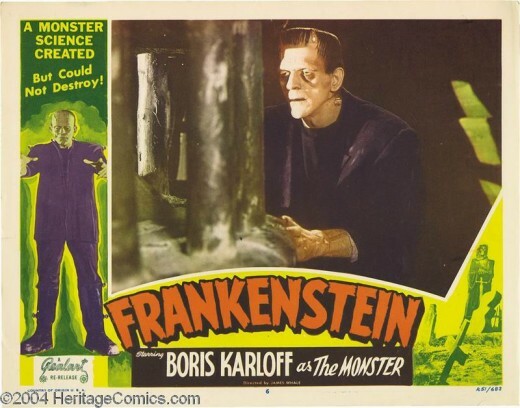 Other actors have played the part including, Lon Chaney Jr, Bela Lugosi, Christopher Lee, Peter Boyle and Robert De Niro but none of them have come close to Karloff’s definitive portrayal. 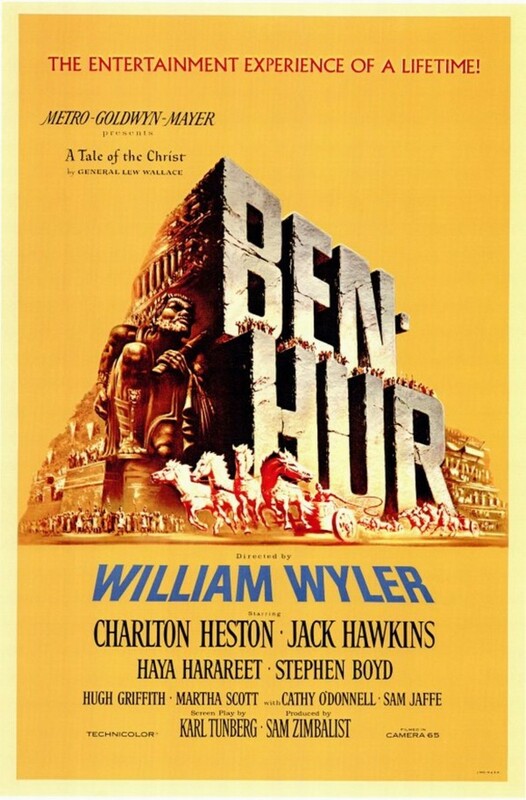 Born in London, England, Karloff's real name was William Henry Pratt. James Whale had seen Karloff play a convict in The Criminal Code (1931 Howard Hawks) and thought he might be suitable as the monster in his new film. 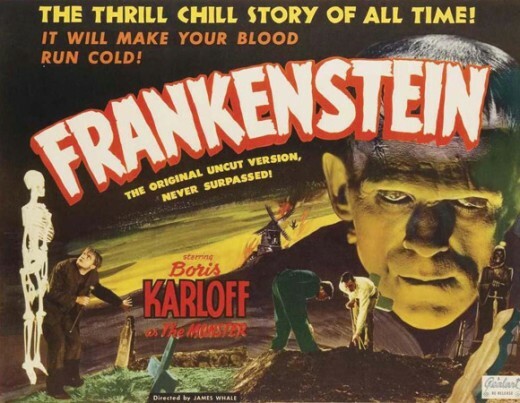 The success of Frankenstein jump-started Karloff’s career in horror films. He would play the Frankenstein monster again in two sequels, Bride of Frankenstein (1935) and Son of Frankenstein (1939 Rowland V. Lee). 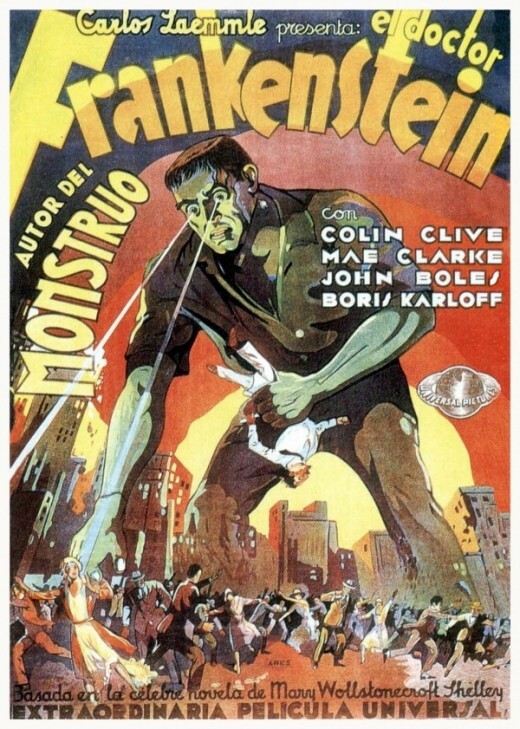 Other classic roles which followed Frankenstein include The Mummy (1932), The Old Dark House (1932), The Mask of Fu Manchu (1932), The Black Cat (1934) and The Raven (1935). One of Karloff’s last films was Targets (1968) directed by Peter Bogdanovich. Karloff plays an aging horror movie star, Byron Orlok, who confronts real horror in the shape of a murderous young sniper. Edward Van Sloan (1882-1964) / Dr, Waldman, Henry’s old medical professor. 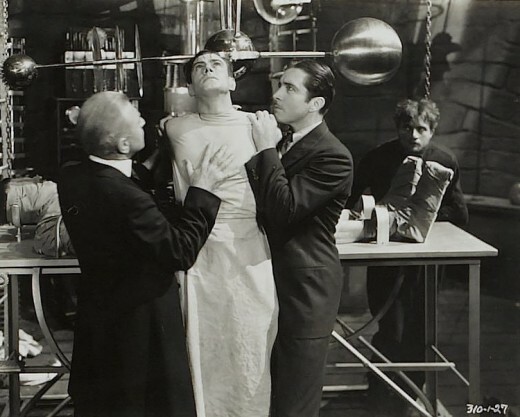 He is against Henry’s experiments and warns him that the brain stolen from his laboratory was a criminal brain. Van Sloan appears before the opening credits warning the audience that the movie may shock and horrify. Born in Minnesota, USA, Edward Van Sloan secured his place in movie history as the first actor to play Abraham Van Helsing on screen in Tod Browning’s Dracula (1931) starring Bela Lugosi as the Count. 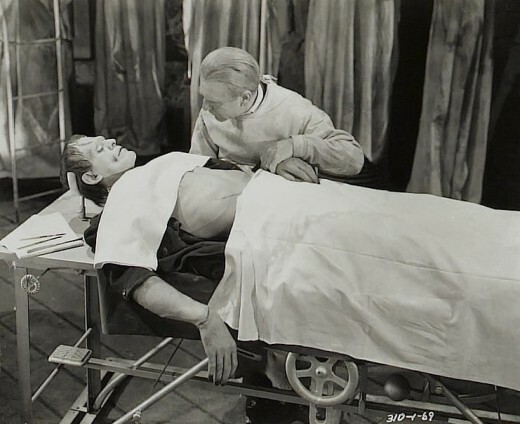 Van Sloan also appeared as Dr, Muller in the Karloff classic The Mummy (1932 Karl Freund). Dwight Frye (1899-1943) / Fritz Frankenstein’s hunchbacked assistant. Fritz likes nothing better than to torture the monster by waving a flaming torch in its face, but the tormented creature finally kills him. Born in Kansas, this was the second of two classic horror roles for Dwight Frye, the first was as the mad Renfield in Dracula (1931). James Whale (1889-1957) moved from England to Hollywood in the late twenties, his first movie was Journey’s End (1930). After the success of that film Universal studios let him choose what he wanted to do next. 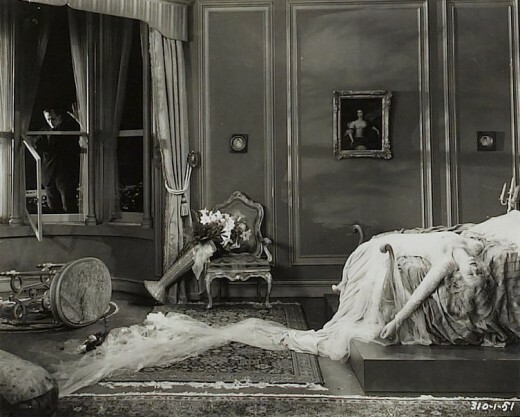 Tod Browning’s Dracula was a hit earlier in 1931 and so James Whale chose Frankenstein as his next film. 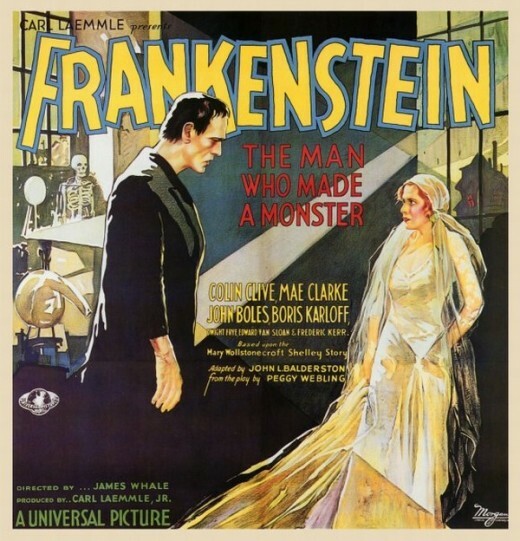 James Whale followed Frankenstein with three more genre classics – The Old Dark House (1932), The Invisible Man (1933) and Bride of Frankenstein (1935). He also directed the classic musical Showboat (1936). Suffering from depression James Whale committed suicide in 1957. John Carradine (1906-1988) and Bela Lugosi (1882-1956) both turned down the role of the Frankenstein monster, Carradine thought it wasn’t a role for a highly trained actor to play. Lugosi tested for the monster but complained that there was no dialogue and that he was too good looking to play a monster. 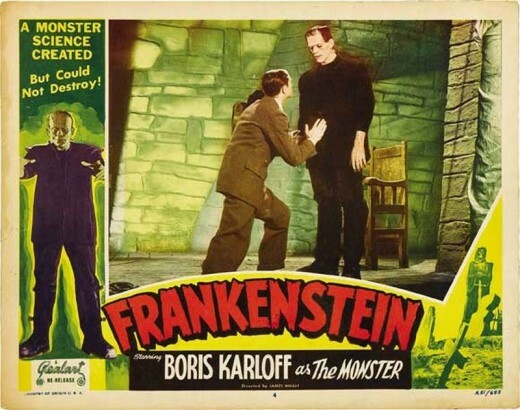 Lugosi would eventually play the monster in the 4th sequel Frankenstein Meets the Wolfman (1943 Roy William Neill). Henry Frankenstein: There's nothing to fear. Look. No blood, no decay. Just a few stitches. And look, here's the final touch. The brain you stole, Fritz. Think of it. The brain of a dead man waiting to live again in a body I made with my own hands, with my own hands. Let's have one final test. Throw the switches. 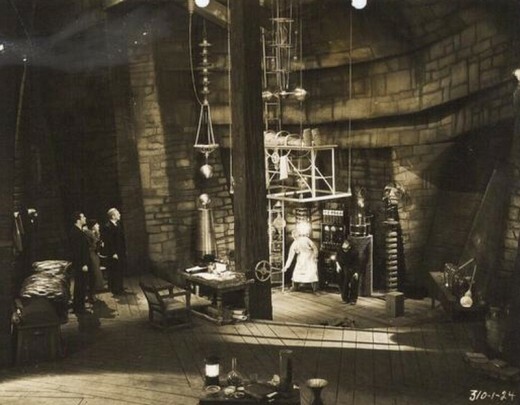 Kenneth Strickfaden (1896-1984) created the laboratory equipment and electrical effects for the film. They would be used again in the sequel. Mel Brooks Young Frankenstein (1974) thanked Strickfaden for “original Frankenstein laboratory equipment” in its credits. Make up artist Jack Pierce (1889-1968) created the iconic look of the monster. The Greek-born make up maestro had also worked on Conrad Veidt’s rictus grin for The Man Who Laughs (1928) one of the inspirations for Batman’s nemesis the Joker. Pierce came up with the idea of giving the monster a flat head which can be opened for access to the brain and electrodes (not bolts) on the neck. 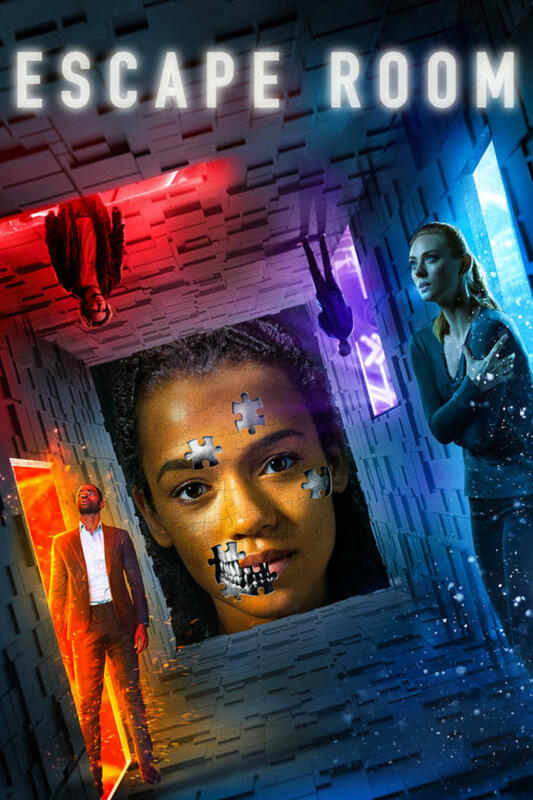 In the novel the monster demands a mate, Victor Frankenstein starts to build a female companion for it, but thinking that this might result in a whole race of monsters plaguing mankind he destroys it. The monster vows revenge and on Victor’s wedding night it kills Elizabeth. 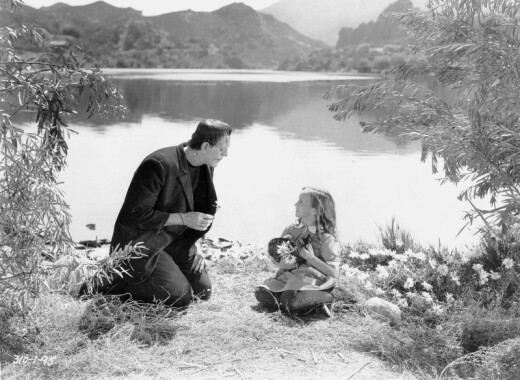 A famous cut scene in Frankenstein now restored was the scene in which the monster, throwing flowers in a lake with a friendly little girl, runs out of flowers and throws the girl into the lake instead thinking she would float like the flowers, the girl drowns. The shot of the monster picking the little girl and throwing her in was edited out by Universal in 1934 thanks to demands by the new stricter Production Code. The cut actually made the scene a lot nastier because you weren’t sure what the monster did to the little girl. 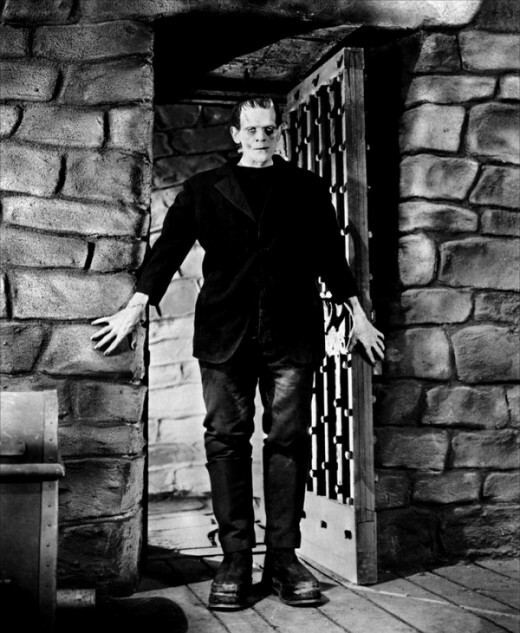 Another cut which is now reinstated was a line of dialogue from Henry Frankenstein after he brings the monster to life – “In the name of God! Now I know what it feels like to be God!” – It was considered blasphemous in some US States and removed, the splice was covered with a clap of thunder. 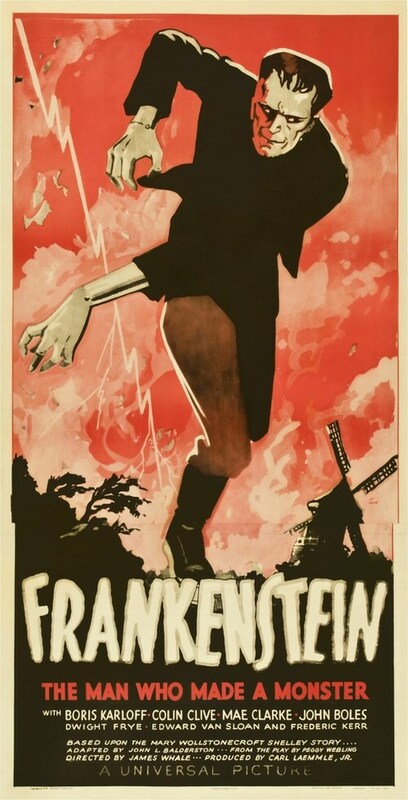 Originally Henry Frankenstein died when he was thrown off the windmill by the monster but it was later decided to give the film a happier ending and a new scene was added showing Henry recovering. 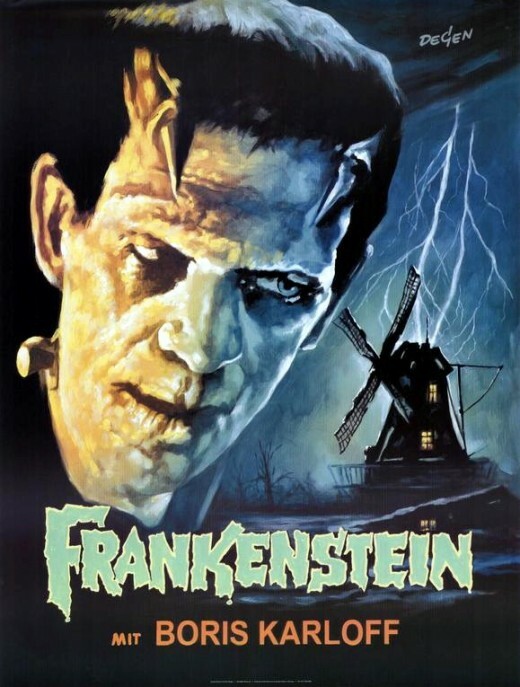 Frankenstein was ranked #87 on the American Film Institute's 1998 list of 100 Greatest Movies, #56 on AFI’s 100 Greatest Thrillers and the line “It’s alive! It’s alive!” ranked #49 on the AFI's 100 Greatest Movie Quotes list. Dracula and Frankenstein were big successes for Universal Studios in 1931 and they ushered in the golden age of horror films which lasted almost two decades. 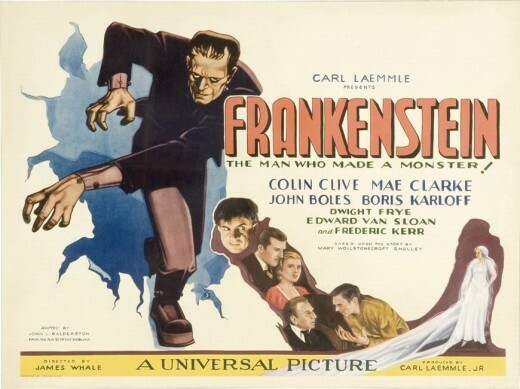 Universal Studios produced 6 more Frankenstein movies – Bride of Frankenstein (1935 James Whale), Son of Frankenstein (1939 Rowland V. Lee), Ghost of Frankenstein (1942 Erle C. Kenton). Frankenstein Meets the Wolfman (1943 Roy William Neill), House of Frankenstein (1944 Erle C. Kenton) and House of Dracula (1945 Erle C. Kenton). 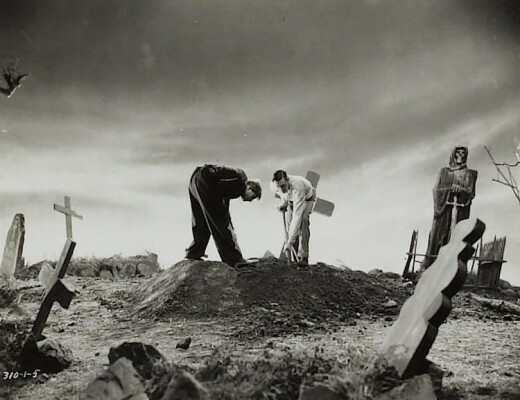 The comedy Abbott and Costello meet Frankenstein (1948 Charles Barton) was the final nail in the coffin for the Universal Frankenstein series. "Looks like a "Dracula" plus, touching a new peak in horror plays and handled in production with supreme craftsmanship. Playing is perfectly paced. Colin Clive is a happy choice for the scientist driven by a frenzy for knowledge. He plays it with force, but innocent of ranting. I'm glad you enjoyed it Doc Sonic, your comment is very much appreciated. I love these old horrors and I'm a huge Hammer fan too. hmmm I should do a Hammer horror hub one of these days. 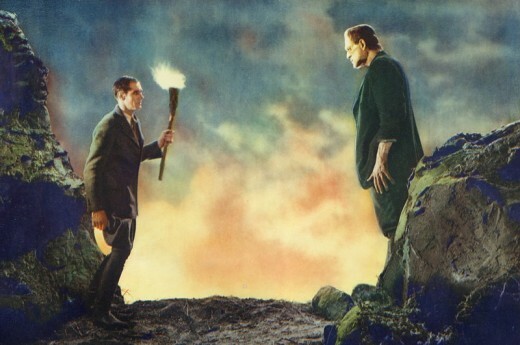 The classic Universal horror films have never been matched, and Frankenstein is one of the best of the bunch. I've enjoyed your very comprehensive, well-written guide to the film, and I'm looking forward to catching up on the rest of your hubs. Things to Come is classic British sci-fi Bruce and one of my most viewed hubs for some weird reason. Glad you enjoyed Bride, great film. 'Son of' is not as good but it does have Basil Rathbone, Lionel Atwill and Bela Lugosi along with Karloff. Just finished Bride of Frankenstein. I noticed in the opening credits...Boris Karloff went from ? to Karloff...I wonder when he reached Boris Karloff. 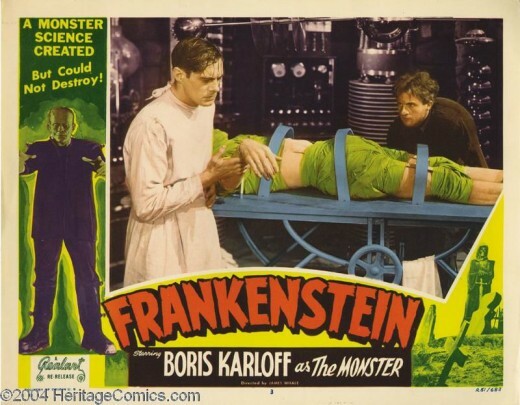 The 2nd Frankenstein had much more humor and Karloff's performance was excellent. I did enjoy Bride more than Frankenstein. Just thought I would update you on my Frankenstein progress....next on my movie going schedule...a repeat viewing of H.G. Wells Things to Come. Thanks Bruce and I'm glad my hub has got you interested in watching these ancient horror films. They make a change from the loud gory teenage horror flicks that have dominated the genre for three decades. I think you'll enjoy Bride more, the monster wants the doctor to make him a mate and he learns to talk too. 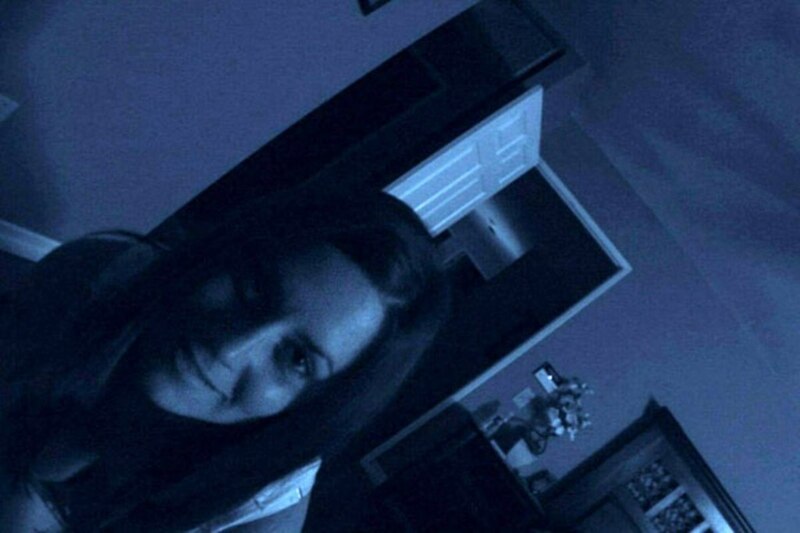 Some critics consider it the best horror film ever made. Well 23 hours later and I can tell you I have now seen Frankenstein.....although the warning at the beginning of the movie almost scared me away.....lol. I loved the opening credits when Boris Karloff got a ? 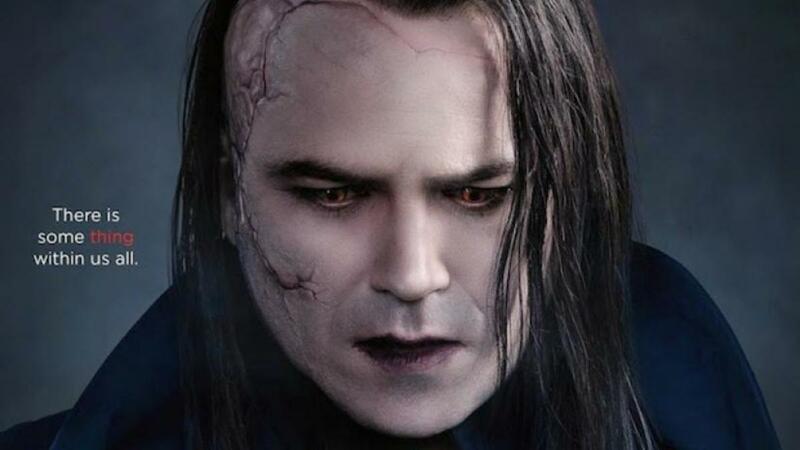 as the man who played the monster. Things I noticed....Fritz was a sadistic character who probably got what he deserved....it seems the "Igor part" is now comic relief. After seeing Young Frankenstein so many times it was strange finally seeing this movie....overall I felt that it was a very good movie...I was not impressed the acting of Mae Clark...she looked like a silent movie star trying to get used to the new "talkies"....it got my 5 year's old attention more than once...although she did not like it when the Monster threw the little girl into the lake. So after seeing the movie I can tell really say that your hub is outstanding...so I am voting it up again....on to The Bride of Frankenstein. Thanks for commenting Rob, it is appreciated. 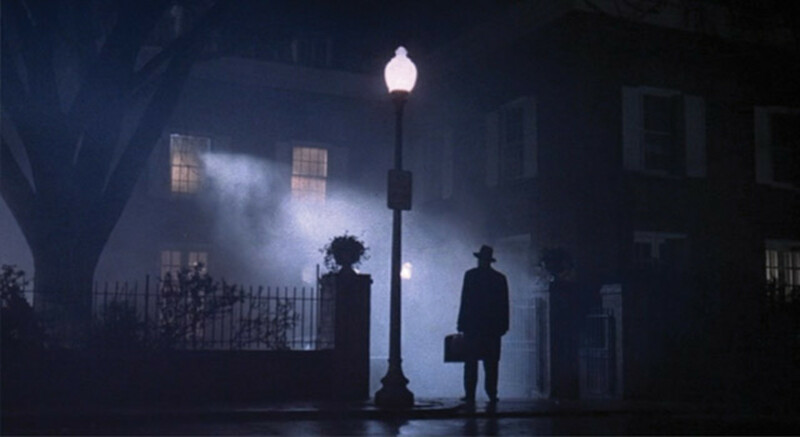 One of my all-time favorite films and I think one of the greatest horror films ever made. I've been a Franken-fan since I was a little kid watching "Frankenstein" on commercial television, on a B & W TV with rabbit ear antennas, on Halloween. Karloff was amazing in the role, adding such sympathy and pathos to an unspeaking monster. He's really an under-rated actor. Classic movie. I enjoyed the hub. Perfect for Halloween. Btw I stopped renting films ages ago, I've been buying movies for decades now. Nearly 3000 films on DVD and Blu-ray. And a whole bunch on VHS I have to get rid off. Thanks for the information Flora and Steve.....I reserved the movie...so it should be at my closest library in one or two days....and then I might have 4 classic horror movies to watch. Thank you Bruce your comments are very much appreciated. 384mins? Yep must be the Legacy set which includes the other Frankensteins except House of Dracula which is included in the Dracula legacy set. I bought the big box set which includes all the famous monsters and includes polystone busts of the Monster, Dracula and Wolfman. very nice. Cogerson-the Legacy Collection has to be the one in your library as the 1931 film is less than 90 minutes long. This will be a great opportunity to watch the films back to back! Great hub lots of information on this movie...I have seen bits and pieces of this movie over the years...but have never watch the whole movie before....but after reading your Illustrated Reference it is moving towards the top of my movies to watch list. So I just checked my awesome library and they have a copy of this movie...but it says it is a two disc edition that runs 384 minutes...do you think that is the Legacy Collection you have listed? A for your hub....awesome job....great photos, great information and great trivia. I enjoyed reading the critic's reviews as well as reading about how high this movie is ranked on so many lists. I should be seeing this movie in the next few days....voted up and awesome. Thanks for popping in vmartinezwilson. 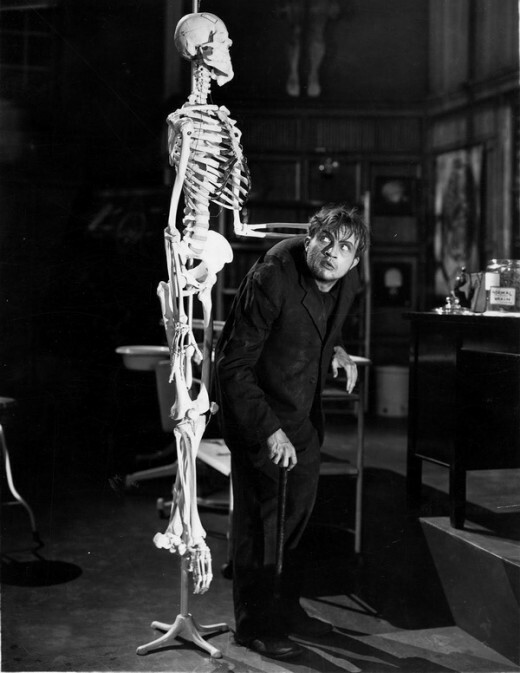 I just noticed that James Whale's Frankenstein will be 80 years old this month! This is such a good movie. Thanks for the reminder. I've been going from classics to modern day gore the last few days and completely overlooked this one! I needed a Halloween hub Flora and I wanted to do one on a classic horror movie and you can't get much more classic than this old horror. This and it's sequel are my faves of the Universal horror series, I also have a soft spot for Son of Frankenstein and The Wolfman. They're all good fun. I love this movie and its sequel. 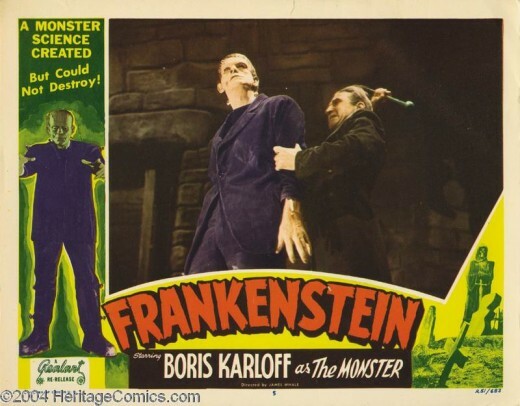 Although I enjoy the Gene Wilder directed movie when I am in the mood for a comedy, no serious version of Frankenstein interests me besides those two starring Karloff. I have also read the novel. Great day to debut this hub.